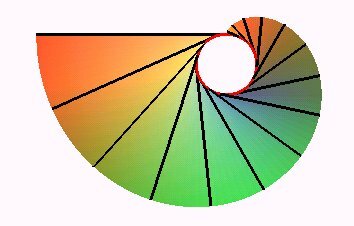 Cartesian parametrization: (where a is the radius of base circle of the helix and its vertical shift is 2pb). Curvature lines: the generatrices and the level curves. 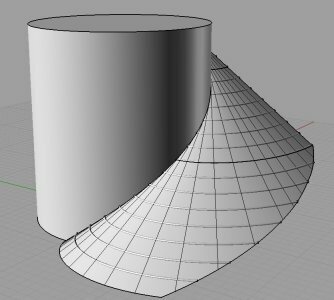 The developable helicoid is the surface generated by the tangents to a circular helix. Figure showing the helix and its half-tangents. 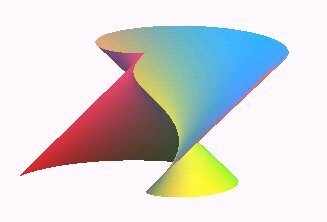 It is a surface of equal slope (like any surface generated by the tangents to a helix), and it is the only helicoid to be developable. 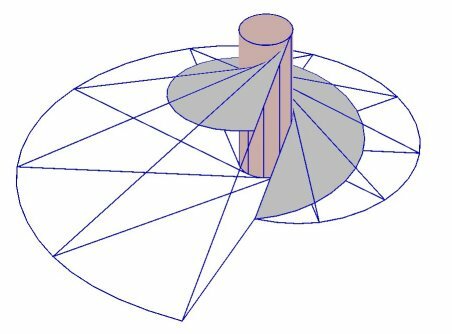 The level curves (sections by horizontal planes) are involute of circles; they are the involutes of the cuspidal edge (which is a helix) as well as the involutes of the cylinder that contains the helix. 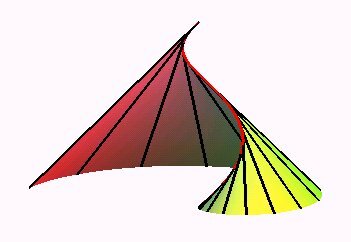 take a tinfoil roll, unwind a length of foil equal to its width, form a right triangle by folding diagonally, re-wind, and unwind again while keeping the foil tight; the diagonal generates the developable helicoid and its tip a beautiful involute of a circle. 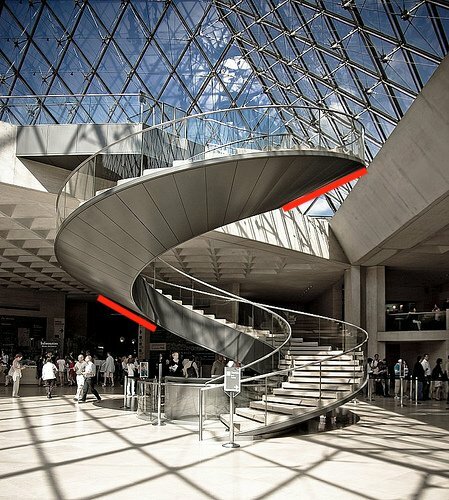 Entrance staircase of the Louvre by the Pyramid. Of course, the stairs generate a right helicoid but the surface under the staircase (the intrados) is a portion of a developable helicoid. Notice indeed that the visible outline of the surface is composed of linear generatrices (cf. red lines).